Some of the most popular pet turtles -- red-eared sliders (Trachemys scripta elegans), painted turtles (Chrysemys picta) and map turtles (Graptemys sp.) for instance -- are known for basking behavior. They spend hours daily resting and basking out of the water. Unfortunately, because of the numerous variables and paucity of quality commercial products, you may have to construct your own basking platform or dock for your pet turtle. No ideal dock or basking platform exists; all have their pros and cons. As long as your turtle's needs are met, the type of dock doesn't matter. Do-it-yourself-oriented keepers will likely favor the custom-built approach, while others may appreciate the ease of a commercially produced unit. Docks can be floating, attached to the side of the tank or supported from below. Some keepers prefer to use natural materials like stones and sticks to make a dock, whereas other like to use impervious, easily cleaned materials. 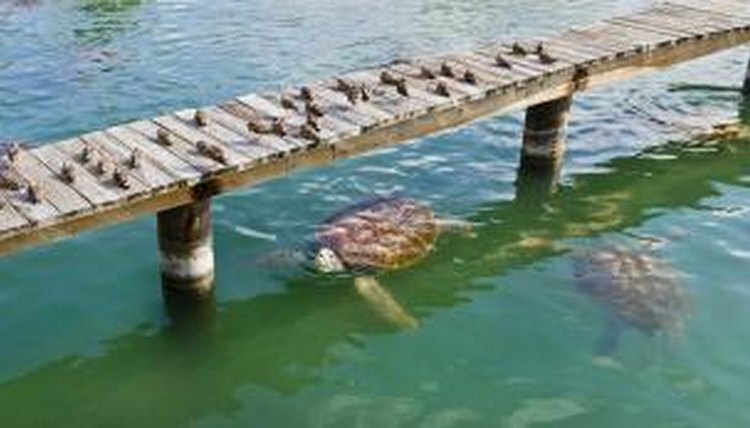 A basking turtle requires at least one dock under the basking site, but it is a good idea to provide him with an additional dock with a cooler temperature. The turtle must be able to easily climb up on the platform, bask comfortably while there and eventually slide back in the water safely and easily. Additionally, the basking spot must be removable or easy to clean while still in the habitat. Floating docks are easy to create and customize but have several drawbacks. Use a foam block to make the bulk of the dock; carve it into a natural shape or leave it square – the turtles are happy either way. Seal the foam with a nontoxic sealant. At this point, it becomes a game of experimentation. Tweak the buoyancy of the dock so it is low enough in the water that the turtle can climb up on it yet it still floats high enough to create a proper basking site. It is more difficult for turtles to climb onto such a moving platform, and the platform will move about the tank and thus out from under the basking lamp. Attach natural logs or sticks to the side of the tank using suction cups or improvised clamps to make a realistic dock. Alternatively, construct stacks of rocks or wooden pillars to support the dock from below. The only commonly available commercial option is the stationary dock. Through suction cups, clamps or straps, a plastic plank attaches to the side of the habitat. The ease of use eliminates much of the trial and error that accompanies custom made docks. This makes commercial stationary docks good choices for beginners. If you use a sand or gravel substrate in your turtle’s tank, pile extra gravel at one side of the cage to mimic the slope of a beach. For those seeking natural-looking cages, this is the best approach to take. Given enough room, you can create a well-planted land area that can also serve as an egg-laying site. This approach has drawbacks, too: The deep layer of gravel can be difficult to clean, and the additional substrate will increase the cost and weight of the tank.